Well we've been back from vacation for almost a month and still no posts about our trip. I think the reason nothing is done is because the task seems to overwhelming. Today I decided to break the trip up into smaller segments and post a little bit at a time. This first post will cover the first two and a half days. On Friday, the 23rd, we packed the van and started the first leg of our eastern road trip. It was a struggle to get out of the house as the kids were using all of their extra energy to try their parents patience. We finally got on the road about 5:30 pm, stopped at Dairy Queen for supper, and arrived at our first stop, a Holiday Inn Express in Newton Falls, Ohio, around 10:30 pm. The girls were still up, but Kade had fallen asleep about 15 minutes prior to arriving at the hotel. We checked in, found our room, and finally got the kids to settle down and go to sleep. Saturday morning we woke up, had our free express breakfast, put our diving suits (Kade's word for bathing suits) on, and went for a morning swim in the pool. Megan seems to be learning how to swim, Mattey enjoyed floating around using two noodle floaties, and Kaden really got into jumping into the pool. We then headed back to the rode. After about 20 minutes Kelly realized she had forgotten her pillow. So it was back to the hotel. After getting the pillow and taking a bathroom break, we were back on our way to Virginia. We stopped at a rest stop in Pennsylvania. Megan thought it smelled terrible. I guess it did since there were about five different foods being made, coffee, and the bathroom right there, not to mention all the people inside. There were a lot of motorcycles parked outside. We guessed they were going to something for Memorial Day. We arrived at the Karren's house around 5:30. Abby and Emma (and Jack) were waiting for us. We were happy to be out of the van. John and Michelle were gracious hosts and let us use their basement apartment for the week. If you have to stay in a basement that's the one to stay in. We had dinner on their deck and the kids loved being with each other. More pictures from our first day in Virginia are available here. Sunday Kelly made our favorite Cinnabon coffee cake to share with the Karrens. We went to church at 1:00. 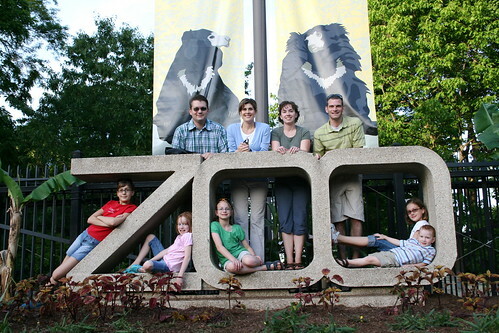 After church we came home to change and have an early dinner and then we went to the National Zoo in DC. The only animal that was still out was one elephant. She was quite entertaining. Then we stopped by the visitors center at the DC temple. We looked around a room that was all about the life of President Hinckley. Later we took a walk towards the temple to take a closer look. Kade said the temple was broken. We asked him what he meant and he said it wasn't shooting fire. I wonder what gave him the idea that Moroni was supposed to be shooting fire on top of the temple. I might have to question what he's being taught in nursery. The girls took turns driving with each other, Megan with Abby and Matttey with Emma. They really enjoy each others company. Poor Kade was stuck driving with us even after he protested. More pictures from day two available here. It's real. I was a witness. Wow! That Karren family seems so nice! We had a fun time with you all. Thanks for coming. Hey Standiford Family. I have been looking for an email address on this site to try to contact you or find out a bit more. I am a Standiford originally from Fort Wayne IN but now in St. Peters MO. I would really be interested in contacting you to find out more about your family tree. I put my email in when I registered for this site so perhaps you can drop me an email. BTW... quite a site. I'm impressed by how well you have done at keeping it up. I have a blog but have not been very consistant. Hope to hear from you. 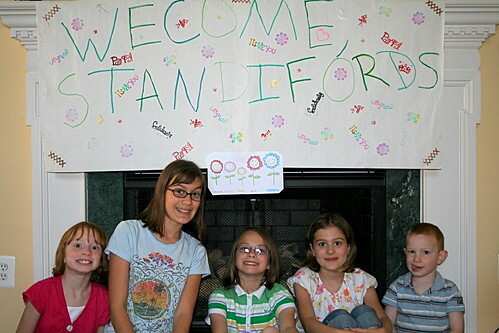 Standiford Family, I really enjoyed looking at your web site. 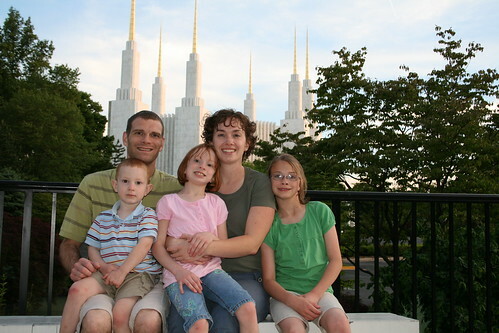 My family and I are also members of the LDS church, my Standiford side of family is from Western Montana. We currently reside in Albuquerque, NM and have 7 children (4 sons, 3 daughters)and the youngest is 11. When you get a chance please contact me, I would be interested in exchanging family history information.